Heavenly Culture, World Peace, Restoration of Light (HWPL), a UN DPI registered NGO, raised USD 43,284.82 (KRW 50,145,460) for The Ecuador Earthquake Relief Fund, during the May 25th, 3rd Annual Commemoration of the Declaration of World Peace and Peace Walk. 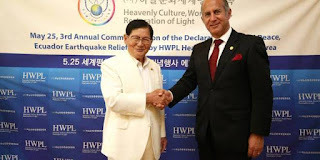 The delivery ceremony was held at the Peace Palace in Gyeonggi Province, and attended by Chairman Man Hee Lee of HWPL, Chairwoman of the International Women’s Peace Group (IWPG), Ambassador Oscar Gustavo Herrera Gilbert, and Deputy Chief of Mission and Consul General of Ecuador, Ambassador Jorge Alberto Icaza. In honor and remembrance of the victims of a massive earthquake that killed more than 600 and injured 27,700 people in Ecuador, all participants observed a silent tribute and expressed condolence for the lives lost. “Not only in helping through the fund, but we are putting the minds for peace into our contribution. The spirit and the heart of people who have contributed will be passed on to the Ecuadorians,” added Chairwoman Kim. On Wednesday May 25th, at the World Peace Gate in Seoul Olympic Park and in major cities like Busan and Gwangju, where the commemorative event was held simultaneously, Ecuador earthquake relief fund booths were located under the theme of ‘Your Help Brings New Life to Ecuador’ and all attendees and volunteers participated in the fund-raising event. Just last year, HWPL immediately sought to raise fund to respond to the earthquake that occurred in Nepal and delivered USD 40,000 to the nation through the respective embassy. HWPL has pioneered various peace activities including relief fund-raising, peace education seminars, and peace walks with its affiliates, the IWPG and the International Peace Youth Group (IPYG). All fund made will be delivered to the government of Ecuador through the Embassy of Ecuador in the Republic of Korea.